Have you been spending a lot of time outside lately? Whenever it’s not raining, we have been playing outside or walking down to the pool. One thing that we are definitely enjoying is our back deck. We didn’t have a patio or a deck at our old house, so this deck is like the coolest thing to us. My favorite times are when we use it are in the morning lounging after breakfast with our coffee or at night after dinner. The kids will actually bring out bean bags to sit with us. It’s fun family time with the woods to stare into. We were given this hand me down old furniture to put out there till we could get some. You know it’s not my favorite, but it’s something and so we are thankful we have it! The one thing that really has been bothering me was the table. It was rocky because of a bent leg. I have been afraid cups would spill or my active toddler would climb on it and somehow fall off and get hurt. It had to go. On one of our many trips to Home Depot, I saw their 16″ Pewter Stepping Stones. They were $3 and I knew I could do something with them. I stood there staring and it hit me. 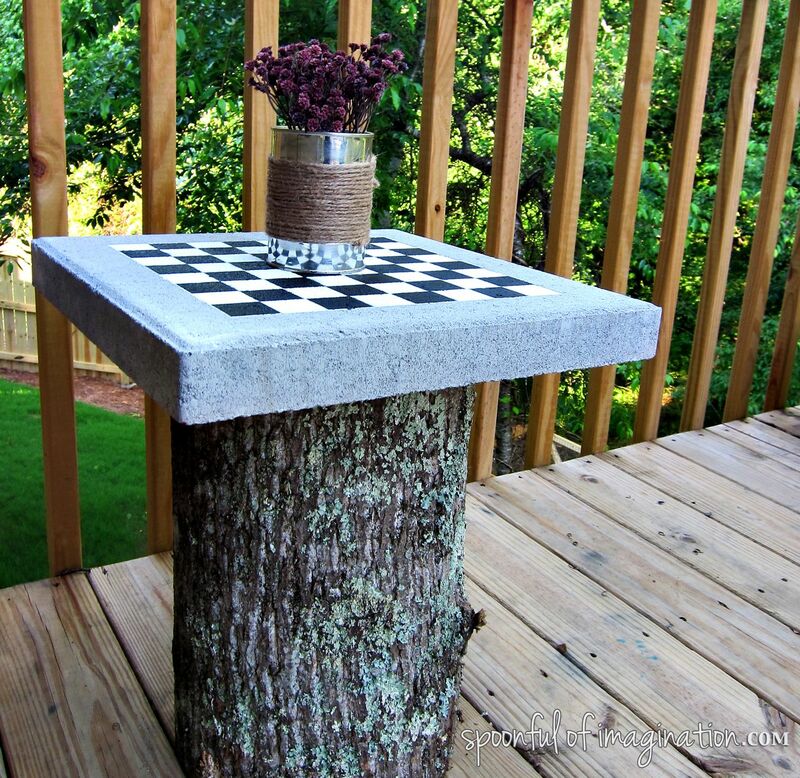 I would make an outdoor end table with one stepping stone. I think this idea came quickly because of my great love for my Log End Table. I was excited and inspired to turn it into something practical yet fun. I landed on making a checkerboard on top. Here is how you do it! 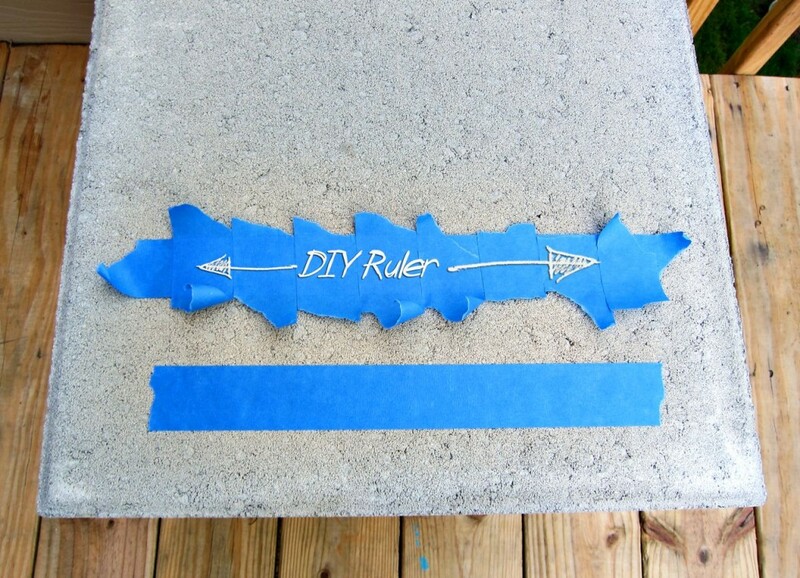 to create my own ruler. Eight little pieces of tape all lines up side by side would equal the width of my checker board. Note: I ended up taping all those little pieces in a row on another long piece of tape, so i could quickly move my make shift ruler around without having to pick up each little piece at a time. I used the ruler to figure out the length of the bottom of my checkerboard and I just eye balled it to go in the center of the stepping stone. I then pulled up my ruler and rotated it to get the side get the length for that side of the checker board, being careful to start the length at the top of the tape on the bottom. 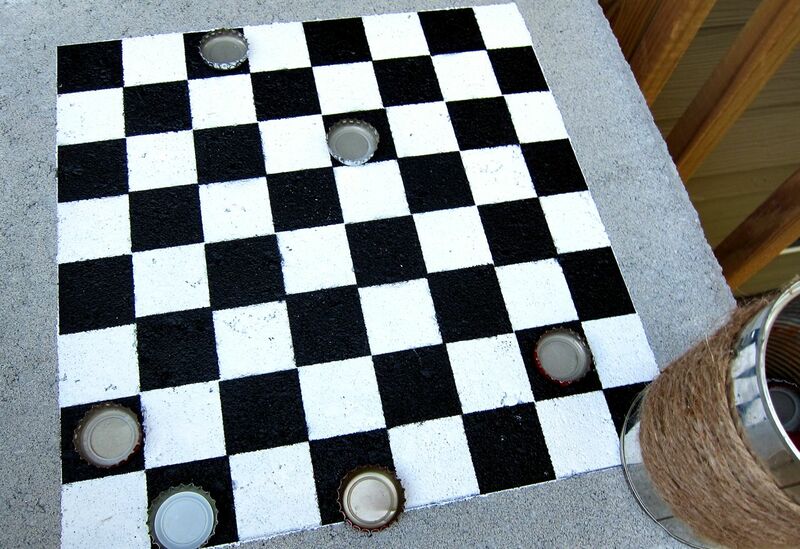 Use this method to get the following two sides for your checker board. 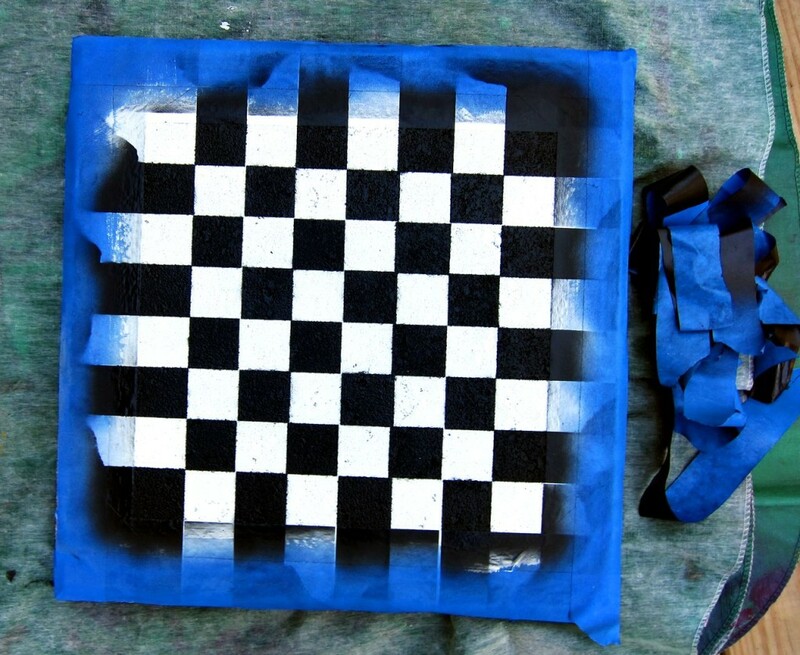 Once you have the outline of the checkerboard, tape off the remaining outside of the stepping stone to make it easier on you while painting. Then paint the Kills primer into the center of the stepping stone. Use your tape then to start measuring for your checker boxes. I started lining up long strips of tape side by side. I used tape as a placeholder to mark the spot, but as soon as I could I pulled it up and rotated it to the next place (see below). Once Your board is taped one direction, rotate your stepping stone and do the same thing going perpendicular to the tape you just placed. Once you have your tape down, press over each strip to make sure it is tight. 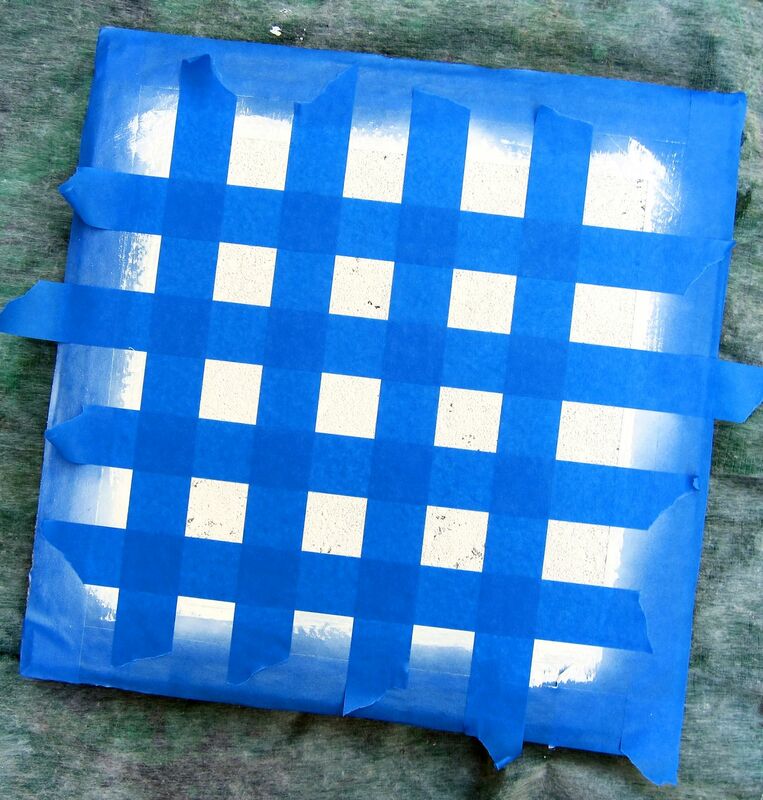 Then use an outdoor spray paint to cover in the squares. I thought about doing a fun color, but ended up doing the basic black. Once that dries, peal up the tape and lay it back down to COVER the black you just painted. You need to do this to create the checker effect. Right now you have 16 black boxes surrounded by the white. By moving the tape grid onto the already painted black you will open up the areas that still need black paint. I’m sorry I forgot to take a pic of this step. Just know that when you peel your tape the first time and wonder, “Oh no, what did I do wrong?” (like I did) you haven’t done anything wrong. You just need to paint one more round of black boxes. 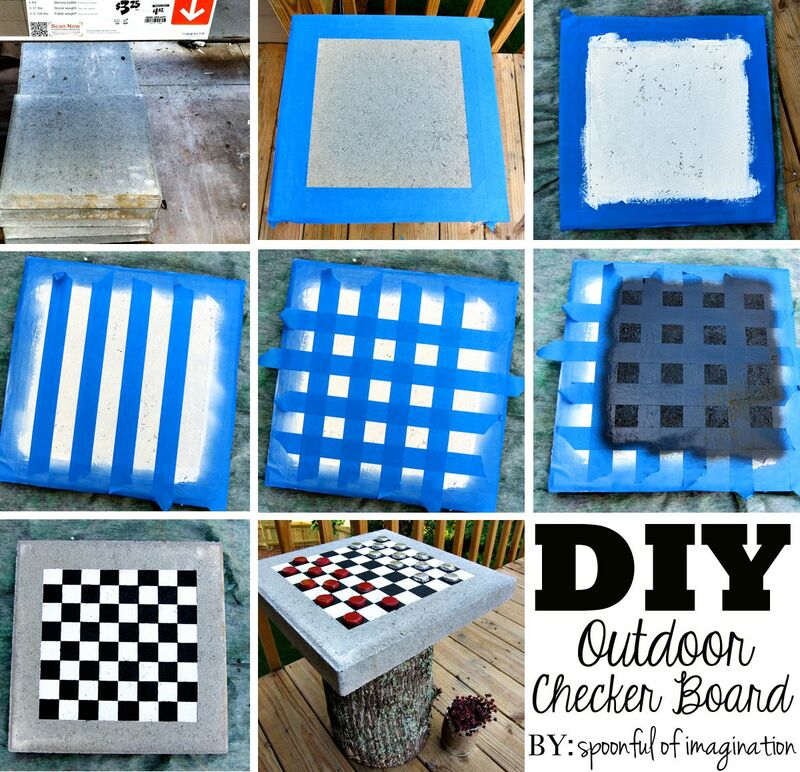 Once you have painted your second set of black boxes and they dry, your checker board is done! Peal up the side tape and place your board on your tree log-or any other creative item you might want to use as a base! I think even a cinder block might be pretty cool. You can also use whatever you want as the game pieces. I spray painted bottle caps as our game pieces. Note: If you use a stepping stone or something else heavy make sure your base is completely level and very sturdy to avoid it falling off when little ones bump it or lean on it. If you use bottle caps, spray the insides as well. I will show you further down as to why. I still need to go back and spay paint the insides of mine. We are currently storing our pieces in an old tin cane wrapped with jute rope and some fake flowers stuck in on top to make it look like a center piece. We are having so much fun already with this little table. I taught my six-year-old how to play the other day, and he might be obsessed now. Sitting outside and enjoying some time and laughs together is one of the highlights of my days. 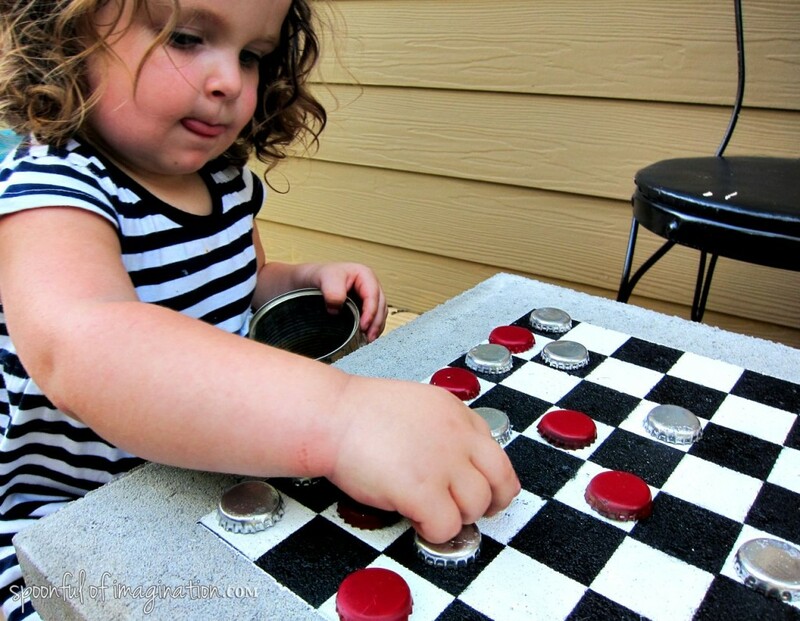 Even my little girl is having fun playing her own version of checkers which is pretty cool to watch. 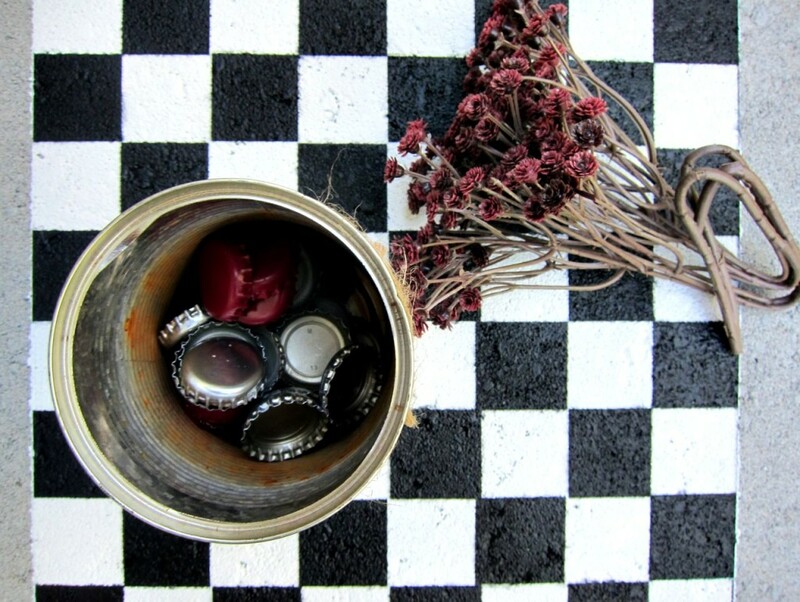 She takes the checker pieces out and lines each one up in its own square. That is one to one correspondence and pretty cool to see her thinking and playing an age appropriate version. The reason I told you to spray the inside of your bottle caps is so you can tell which king is yours. 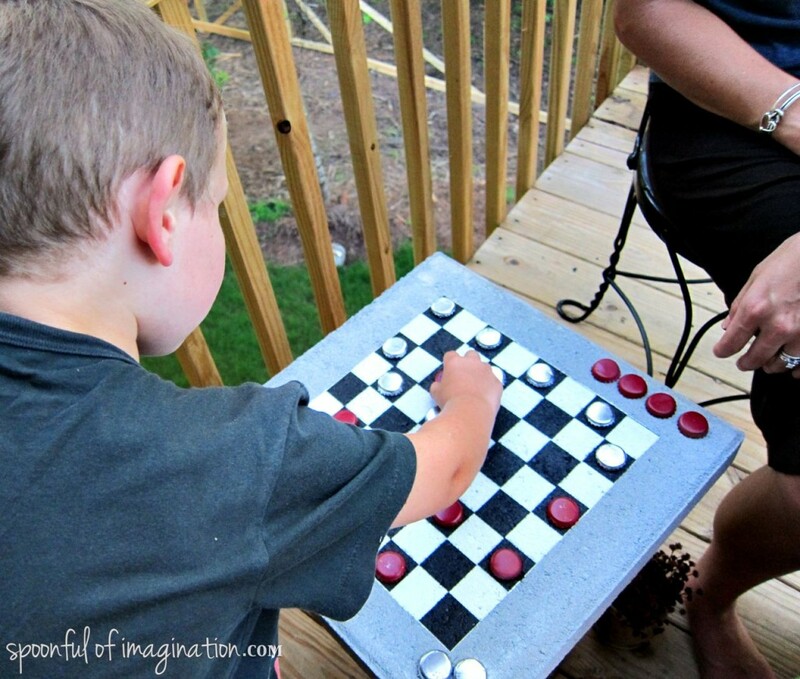 We played that once you were “kinged” you turned your checker over. Well, by the end of our game, we could barely tell which king belonged to us. This project cost literally $3.25 plus tax, since I already had all the other materials on hand. 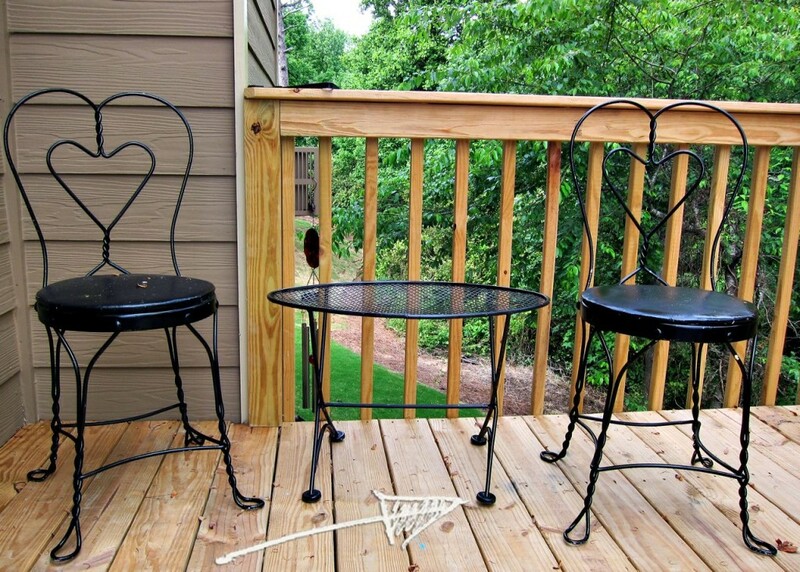 Such a cheap decor to spruce up your outdoor living and help you enjoy the pretty days this summer. 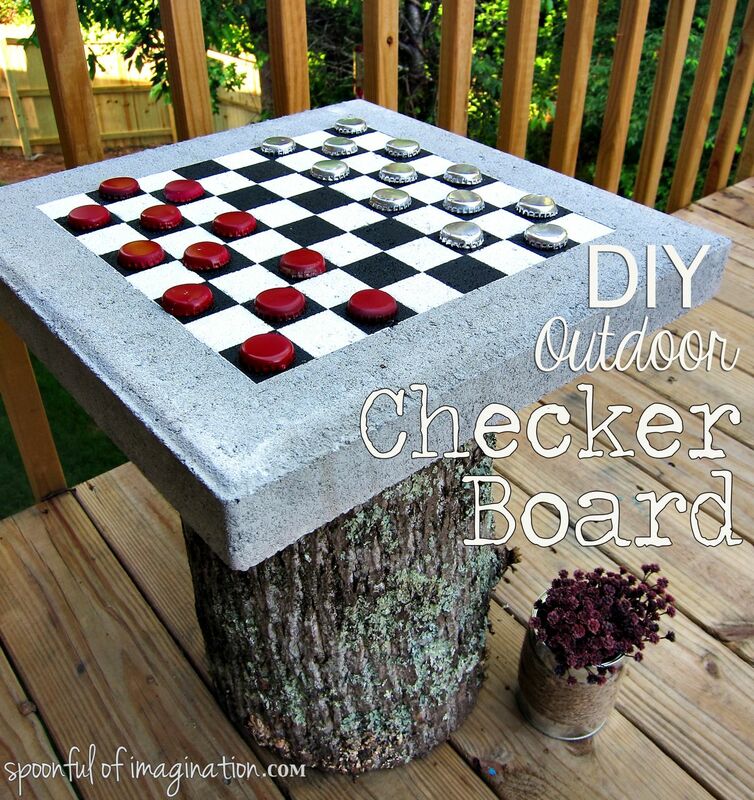 Here is a quick recap if you want to pin or bookmark how to make this outdoor checker board. Thanks so much for stopping by! I hope you have a wonderful weekend and celebrate your dad’s amazingly well this week for Father’s Day! 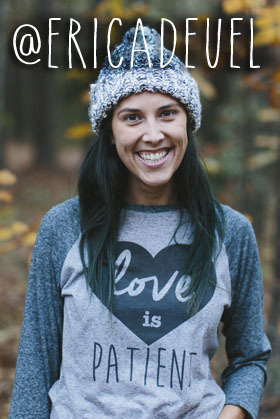 I LOVE this project, Erica!! 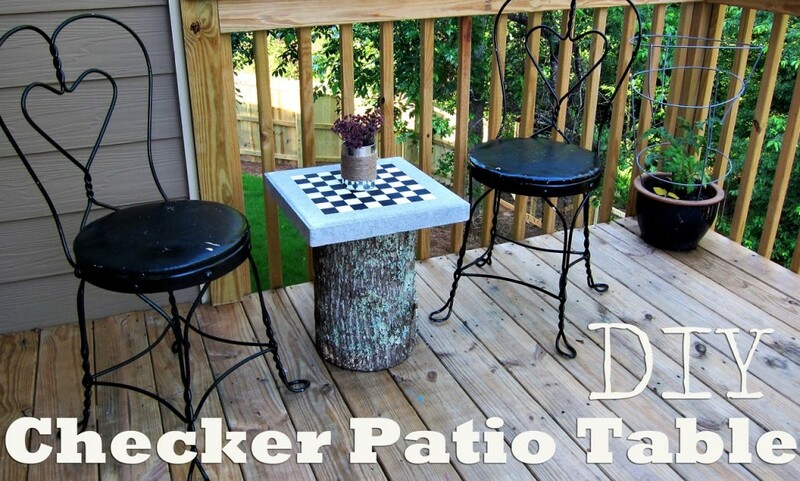 Great idea for more outdoor enjoyment. Pinning and sharing! How did you anchor the paver to the log? 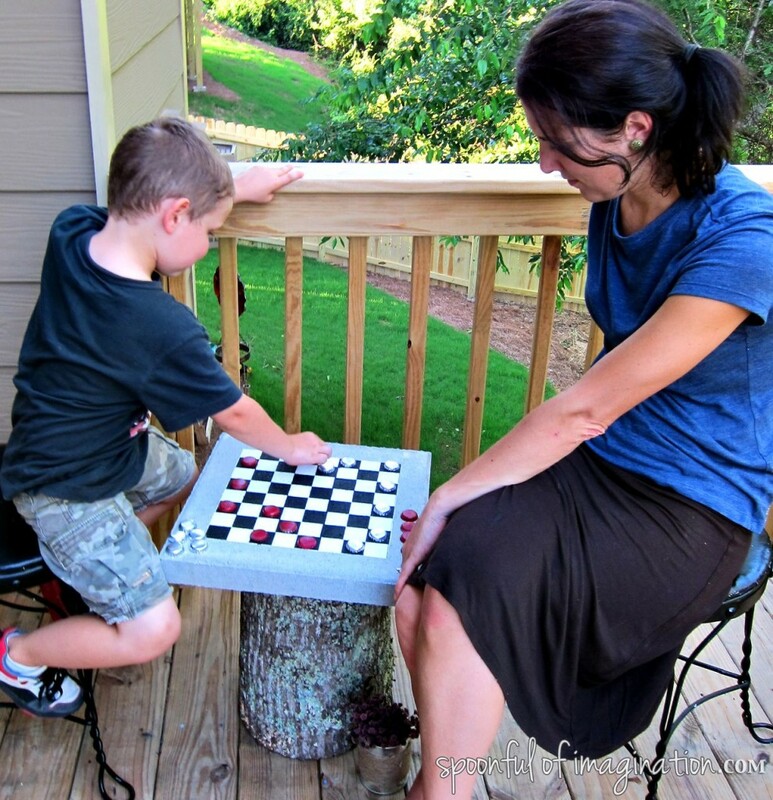 GORGEOUS TABLE… Just a reminder for chess or checkers the light square is always on the RIGHT . I LOVE YOUR TABLE.